Having gone to one of the restaurants the evening of the day that I had received the text, I did not have a camera to photograph the food properly. That meant I had to return. So, I had a break in my schedule — from cleaning my condo — and I dashed to Masouleh Persian Restaurant at 6653 N. Clark Street to recapture the taste and to capture the impressions of the good things that came from their Persian kitchen. I will first start by saying that it is apparent — to me — that the service is consistently top. Although the server was rather soft-spoken, and that may be due to conversational comfort with English, there was the welcoming atmosphere my colleague, two other friends, and I received on our first visit. It may have also helped that my conversational Arabic and attempt at Kurdish eased things a little more. But I had my camera, appetite, and a window seat. I was ready. I had complimentary herbs, radish, and cheese along with pita bread. I cannot stress it enough, but you can never go wrong with cilantro. As for anyone who thinks otherwise, the sun may rise from the west in their world. 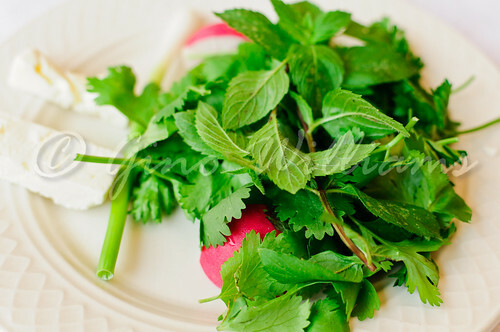 I love radish, so that was a plus. And the “stinky” cheese, although it really does not stink, went well for a palate preparatory and cleanser. The pita bread was not reheated and quite evident to the consistent soft touch right down to the very last piece. 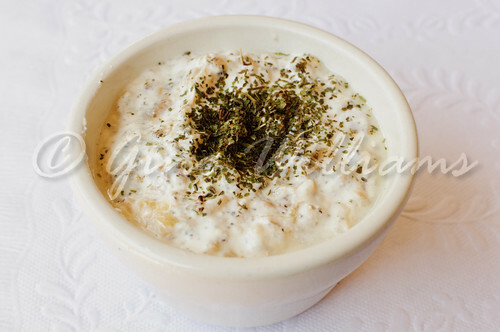 For starters, I had borani badamjan, which was a cup of smoked eggplant in yogurt. It has become increasingly clear to me that eggplant prepared at Middle Eastern and Mediterranean restaurants warrants a shout of bravo. 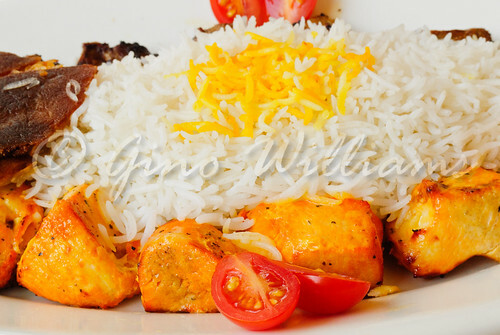 I had gone to an Afghani restaurant several months past and fell in love with the eggplant dish served there. Granted the borani badamjan is chilled, the warmth of the pita balanced out things just nicely. However, the smoked flavouring in the borani badamjan screamed wow. Next was olivieh. This salad of eggs and chicken with a few English peas added was one of the highlights that I was actually hankering for. Hence, part of my reason for returning. 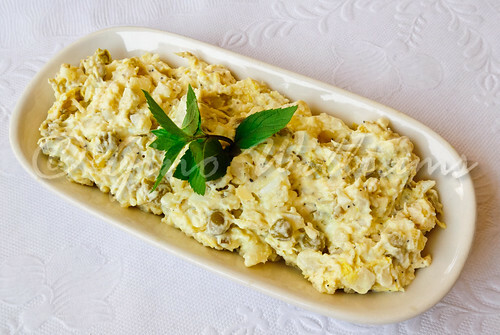 I am not one for eating just anyone’s dish prepared in the manner of egg salad. Trust me when I say that Masouleh is the exception to the rule. With the main dish that I had ordered, there came lentil soup. Again, Middle Eastern and Mediterranean restaurants shine when putting cups and bowls of lentil soup in front of you. 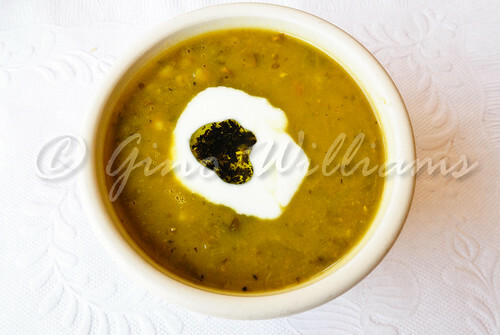 This soup came with a dollop of yogurt and accented further with olive oil and herbs. I honestly believe that the farther away you go from downtown, the more genuine recipes are. Because any lentil soup I have had closer to downtown, the more I am inclined to believe they use some variety of Campbell’s soup because the “common palates” that indulges those eateries don’t know any better. They need to go to Masouleh and quickly. Just to have two choices of meats, I ordered chenjeh, joujeh, and rice. The chenjeh — spiced beef — looked as though it could have been dry. The looks were deceiving because the beef was so tender and juicy that it burst with each bit. There was the same with the joujeh, which was spiced chicken. Each bite was love and with me sitting at the window, it was a presentation in appreciation. As if the beef and the chicken were the only highlights, the rice reminded me of Indian basmati rice. No sticky mess, and no over-cooked fluff, this rice was an idyllic complement to the chenjeh and joujeh, apparent from me polishing off all of it and taking some of the pita bread and going around the plate to get the last of it all. I sat for a while to let things settle and to fend off food comatose. After a few minutes, I inquired about the dessert fare. There were baklava and Persian ice cream. You can get baklava from anywhere. I wouldn’t be surprise if Dunkin Donuts doesn’t have a baklava doughnut. But you can’t get Persian ice cream from just anywhere. Guess what I had. Yes, I had the Persian ice cream, flavoured with rose-water and saffron, and topped with crushed pistachios. 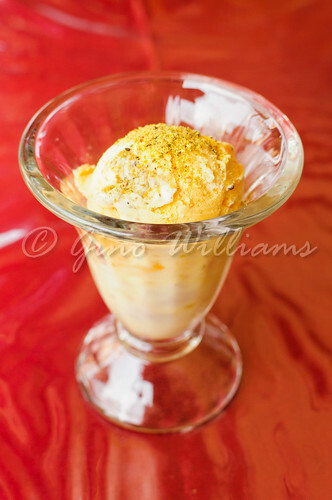 You have not had ice cream until you have had Persian ice cream. Think Haagen Daas is all that? Baskin Robbins gets you doing a skippy-do-da when ice cream comes to mind? Oberweis screams, “Come and get some”? You can’t get enough of Breyers? Is your relationship or marriage about to come undone? Make an appointment to go to Masouleh and have some of that Persian ice cream. It will make everything alright. After spooning as much of the ice cream out of the glass as I could, I had Persian tea. No, we’re not talking Lipton or Nestea. We’re not even talking tea brewed from a tea bag. 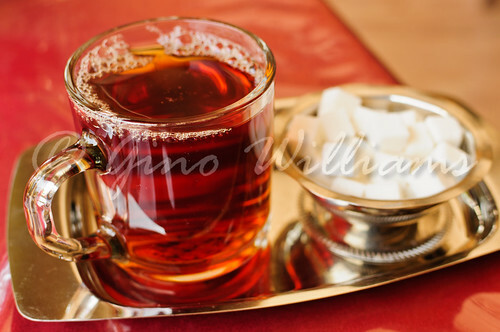 This was authentic Persian tea and a mark of really Persian tea prepared well is that you can drink it without any sugar. I simply sat at the window, sipping tea and smiling. Well, that was after I clicked some photos to post on the blog. But, nevertheless, I had enjoyed my Saturday lunch and thought briefly of those who sit at home — in Chicago, of all places — wondering what to do and where to go. (Pause) No, I won’t tell that lie. I was too well fed to think of any other self-martyrs. Masouleh is not a big box restaurant. While there are more than four tables, the restaurant has an ambience of closeness. It’s the kind of restaurant where you go with family and friends so that you dine communally. I remember the first night going, seeing several tables with Iranians. If there was no other indication of authenticity to the food, seeing other Iranians in the establishment was all that I needed. 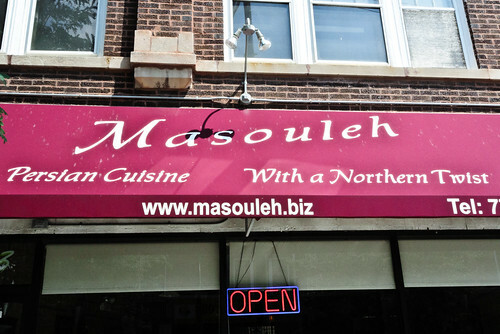 And at the rate Rogers Park is filling in with a lot of cultural variety, Masouleh will quickly become one of many options that I highly recommend. In the meantime, Masouleh is destined to be on my Top 10 list for 2013. 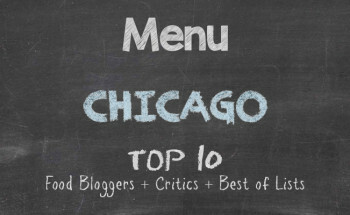 Enter your email address to subscribe to Chicago Alphabet Soup Blog and receive notifications of new posts by email.